Abstract: This paper aims to set down some of the basic facts and figures on the subject of diving. There is no central source from which high quality data can be obtained and this lack of basic information has arisen for a variety of reasons, not least of which has been the rapid growth of the oil–related offshore diving business, the relatively small size of some of the contractors, a fluctuating pattern of employment and, particularly in the past, a relatively high movement of personnel connected with it. This paper sets out to fill in some of the gaps. During the course of its preparation and of the very extensive background research and enquiries, it became more and more apparent that much basic information just does not exist. 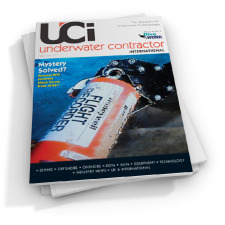 Much of the commercial information, particularly in relation to offshore oil and gas related diving, has been supplied by UK and Norwegian–based diving contractors, but the tables which follow show an almost complete lack of information from other European sources. In order to complete the scenario, a section has been included in this paper on diving in support of scientific activities. Abstract: The Shell/Esso Multifunctional Service Vessel is equipped with both air and mixed gas diving systems. The air systems will enable diving to take place from two fixed and two portable stations to depths of 50m. The main, mixed gas saturation diving, complex allows diving to 200m. The addition of an autonomous diver lock–out submersible facility allows further flexibility of diving effort for subsea maintenance and repair tasks. Abstract: Canada’s entry into offshore exploration for hydrocarbons was only in the late 1960s, but there has been a great spurt in activities during this period as the operations are proving to be economically viable due to the sharp increases in the price of oil and gas. 5. 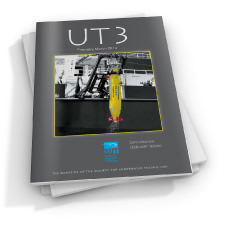 Ancillary subjects: (i) The relevance of a diver training programme to a company’s needs; (ii) Tools and underwater tasks (iii) Communications underwater. In each session three speakers made presentations in order to stimulate discussion with a remit to comment on the present state of the art and to define areas where any improvement or a ‘sharpening up’ was required. The Colloquium also served to explore subjects for inclusion in, and the format of, the International Conference DIVETECH ’81 being organised by the Diving Technology Committee and for which a preliminary announcement has been made. Abstract: The main basis for ethical assessment of human experiments is provided by the Helsinki Declaration and the Tokyo revision of this. These declarations are not legally binding and they are incomplete in some respects but they were drawn up after considerable discussion by people from most of the countries involved in medical research. They at least provide an obvious basis for any plan of ethical supervision of human experimentation, even in such a specialised area as hyperbaric research. They have certainly been an important basis for the work of the committee which has provided ethical supervision for deep hyperbaric work in this country for the last 5 years. Abstract: This paper describes our experiences with the problems of scour and the manner in which we have tried to contain or prevent it in the North Sea and the southern North Sea, in particular. To avoid misunderstandings I shall explain the position of Shell UK Exploration and Production in Lowestoft. From our Lowestoft office we operate and produce natural gas from our share of the Leman and Inde Fields, on behalf of Shell UK and Esso. Abstract: Many terawatts of energy potential are available from the tides, ocean winds and waves, but they are diffuse sources. Tides and tidal currents are probably too diffuse to capture widely, but where the daily tidal waves interact with certain coast lines a concentration of energy can occur that makes a capture a more attractive proposition. Waves act as concentrators of wind energy, transmitting the energy of storms perhaps over thousands of miles. Hence coasts which face a large area of sea like the Atlantic may, given favourable prevailing winds, receive energy from distant storms even when no wind is experienced locally. Even so, large structures spread out over a wide area of sea are necessary to convert this still diffuse resource to useful energy. Offshore wind may not be a strong as that on some special land sites, like hill tops, but it is often stronger and more constant than that on adjacent flat areas of land. Hence the shallower offshore waters may have attractions for wind energy conversion; these attractions may or may not overcome the cost disbenefits of having to build structures in the sea. Generally, one has to look for especially favourable areas if these ocean resources are to be used to provide useful and economic energy. This greatly limits the proportion of the resource that is likely to be exploited. Nevertheless a useful contribution to world electricity supplies of up to several thousands of TWh per year is probably available. The primary role of such supplies from these renewables is to save on the operating costs of the rest of the electricity generating system−that is, to act as a fuel saver. This, therefore, is how their economics have to be judged. Abstract: The Marine Resources Project at Manchester University was established in October 1978 and consists of a team of researches from a variety of academic backgrounds working together on aspects of marine policy. To understand the aims and objectives of this group it is necessary to locate it with respect to three separate organisations. 3. assisting the engineering profession in the enhancement of the quality of the marine environment, while recognising that engineering is practised within legitimate proprietary interests. The purpose of this article is to convey to the adhering bodies a view as to how well ECOR has performed in its efforts to attain these objectives and to provide recommendations for future initiatives. Abstract: In the last decade or so an intensive search has been taking place globally to locate commercially viable offshore oil/gas sources and, inevitably, explorations have moved into increasingly deeper waters. Indeed, the ever–escalating cost of oil/gas, coupled with the projected shortfall relative to future demand, has now intensified this search even more. It is also becoming clear that for deep–water operations a whole new generation of production platforms, some of which are radically different in concept from those used hitherto, will have to be designed and installed; the tension–leg platform, for example, is almost certain to be increasingly used in the future. In the context of installing such facilities in deeper waters it is obvious that the underwater piling hammer is certain to play an important role in the future; this is mainly because the traditional method of pile–driving from a fixed platform, often using long and massive followers, is going to be less effective and certainly more costly in deep waters. Alternatively, underwater hammers which may or may not be sealed but self–contained and therefore easily handled, would appear to provide a number of distinct advantages relative to the conventional method of pile–driving. The design of a free–falling underwater hammer, which is probably the cheapest and simplest of all, leads to a number of interesting, complex but apparently soluble hydrodynamical problems. Clearly , the design optimisation of such a hammer would require an investigation into the effect of the water cushion which develops between the descending hammer and the pile–top, with a view to determining how its detrimental effect can be minimised resulting in enhanced driving efficiency. In this paper a method for achieving this is described. Also included is a brief description of a computer model for determining the hydrodynamic loss of driving efficiency sustained by a free–falling hammer. This piece of potentially highly applicable research was referred to in a paper from P.G. Moore of the University Marine Biological Station, Millport, during the fifteenth Annual Symposium of the Underwater Association, held in the Natural History Museum at Easter. 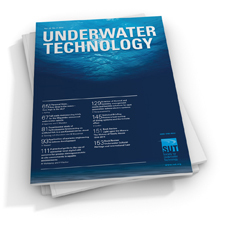 Not all of the papers at this gathering of underwater scientists showed such clear relevance to commercial underwater activity. What they did demonstrate, however, was a lively and by now well established tradition of good research being carried out by scientists who dive. there were fewer signs that in the early days of the Association of the struggle to prove, against the prevailing view of the scientific community, that diving and good research are compatible. Abstract: The Naval Civil Engineering Laboratory (NCEL) is the US Navy’s principal research and development centre for shore and fixed surface and subsurface facilities. As such, NCEL has been involved for approximately 14 years in the development of methods and equipment for nearshore and offshore seafloor construction. This work involves extensive investigations, including design, analysis, and experimentation associated with undersea structures, anchors and moorings, cable dynamics, geotechnical engineering, foundations, diver tools, load–handling systems, power transmission, and work systems to provide broad undersea and seafloor construction capabilities. This paper summarises NCEL work related to the design and operation of remotely controlled seabed vehicles. Three technology areas are addressed: nearshore and deep ocean trafficability, nearshore and offshore trenching and rock drilling, and the design and use of cable systems and umbilicals in the ocean. The motives of each of these groups, so far as technological development is concerned, are different, although closely linked. Abstract: Human activities attempting to increase production by means of artificial control of aquatic animals and plants can be broadly classified into ‘culture’ and ‘propagation’. While ‘culture’ is to produce commercially certain species of aquatic animals or plants by placing the major part of their life history under strict control, ‘propagation’ attempts increased production in natural environments either by controlling a part of the life history of certain animals or plants or by improving the environmental conditions of their habitats. Such an improvement may include transplanting or release of larvae or fry and providing artificial fish shelters. Techniques of larva production are basic and common in the fields of both culture and propagation. Abstract: The increased commercial interest in offshore activities has made operators more aware of the need for anchors of improved performance, which can be accurately placed, to cope with the new offshore facilities. Permanent or semi–permanent installations can generally be provided by a dead weight or some form of embedded anchor, e.g. pile, embedded fluke anchor, although hybrid systems involving dynamic positioning have also been considered for permanent station keeping. for more temporary installations, conventional drag anchors are traditionally used; however, development is underway on suction anchors although it is too early to judge whether these will take a share of the future market. Clearly, neither of the above groups is definite and depending on the form of installation and type of loading a good deal of interchange can take place. In general, a more permanent anchorage requires sophisticated mechanical equipment to achieve a high quality installation whereas a rapid, inexpensive installation with ease of retrieval, hopefully only when required, is characteristic of a temporary anchorage. Holography − Can it be Used Underwater? Abstract: This paper is speculative in nature, concerned with whether or not holography can be used underwater. The principal characteristics of holography, namely, the ability to produce a finely detailed, three dimensional image which retains the parallax, perspective and contrast of the original subject, have made the technique a powerful industrial tool for inspection and archive recording. In addition, a variation of the basic system, known as holographic interferometry, has become an established technique for non–contact strain analysis, defect detection, vibration analysis and transient analysis on engineering structures. 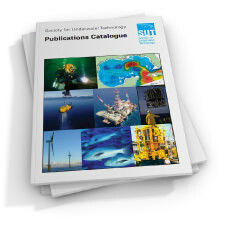 The growth of the offshore oil and gas industries has created interest in performing these techniques underwater, whether the hazardous environment produces immense difficulties in carrying out reliable non–destructive inspection. 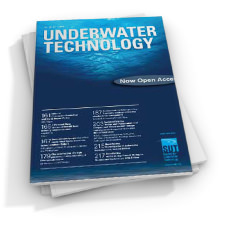 In this paper, a brief description of the basic principles and characteristics of holography is given, before the practical requirements required to produce high quality holograms are related to the situation underwater. The advantages, limitations and potential applications of underwater holography are discussed. Finally, the principles featured which would be required in an underwater holographic camera are outlined. Abstract: The safe accomplishment of the task in hand must be the prime objective of any diving mission. Safe working at depth has may facets; the use of electricity underwater and diver communications are two aspects considered here. At present the maximum depth for working underwater is about 300m but this could perhaps double in time. Abstract: The publication of the Diving Operations at Work Regulations 1981 and the Police Diving Manual has satisfactorily concluded a major stage in the development of all aspects of diving. Both these documents were discussed at this year’s POLDIVE symposium held at Teesside Polytechnic and organised by the Cleveland Constabulary. The success of this meeting was a tribute to the work of the late Mr WG Ashton, former Deputy Chief Constable, Cleveland, who untimely death in May 1981 was a loss to everyone. As in previous years the symposium took as its focus various aspects of the regulations as they applied to all types of diving. these lectures were complemented by a number of informed presentations on equipment and search techniques. The international flavour this year was given by Bernd. W Jackl (Grenzschutzschule, Lubeck) who summarised the training and operations of policy diving units in the Federal Republic of Germany.